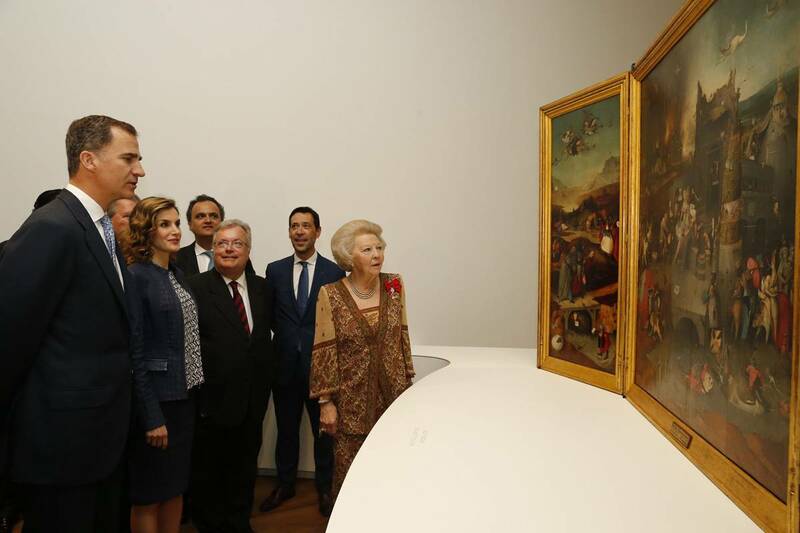 During the afternoon of Monday 30 May Her Royal Highness Princess Beatrix will attend the opening of Bosch: The 5th Centenary Exhibition at the Prado Museum in Madrid. The exhibition will be opened by Their Majesties King Felipe VI and Queen Letizia of Spain. The exhibition marks the 500th anniversary of the death of Hieronymus Bosch, who was born Jheronimus van Aken in &apos;s-Hertogenbosch in around 1450. The Prado Museum has a great many works by Bosch in its own collection. Besides these and works drawn from the Spanish Royal Collection, the comprehensive exhibition includes loans from international museums, including those in Paris, New York and Washington. As a result, over three-quarters of the painter&apos;s works will be on display. The exhibition is arranged thematically, beginning with a general introduction to the artist and his work in his native city of &apos;s-Hertogenbosch. In addition to paintings, the exhibits include miniatures, drawings, etchings and altarpieces. Also featured are paintings by Bosch&apos;s contemporaries such as Alart du Hameel and Adriaen van Wesel. Bosch&apos;s work is famous for its demonic figures, monsters, angels and saints. The artist frequently depicted illusions and hallucinations illustrating notable themes of his own time: temptation, sin, and judgment. These paintings and drawings from the period around 1500 - the transition between the Middle Ages and the Renaissance - reflect the ways in which human beings relate to the world around them and to their Creator. Many of the works displayed were previously on view at the exhibition mounted by the Noordbrabants Museum in &apos;s-Hertogenbosch, which was opened by King Willem-Alexander on 12 February this year.